Now into its fourth exhibition year, MB Crusher America Inc. is once again building connections with the Society of American Military Engineers (SAME) at its event, Joint Engineer Training Conference & Expo (JETC) 2018. 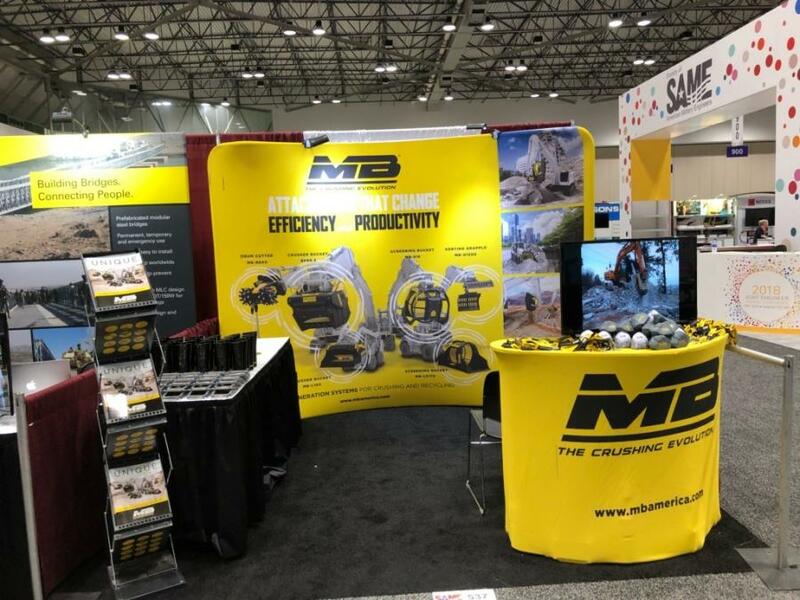 Now into its fourth exhibition year, MB Crusher America Inc. is once again building connections with the Society of American Military Engineers (SAME) at its event, Joint Engineer Training Conference & Expo (JETC) 2018, which was held May 23 to 25 at the Kansas City Convention Center in Kansas City, Mo. The 2018 JETC featured more than 70 education and training opportunities. MB Crusher America Inc. has been working to expand its clientele to include federal and government agencies. In the past couple of years, the company has obtained its GSA Advantage contract and presence in the GSA catalog to include its full product line of crushing and screening attachments, 360-degree rotation grapples and rotary drum cutters for excavators, backhoes, loaders and skid loaders. The company has attended JETC to understand the common challenges faced by government professionals. From there, MB Crusher America worked to provide them with solutions that could enhance their mission capabilities. “JETC is an important conference for us to exhibit for the past few years. We want to continue to build and strengthen connections. We come together to find solutions. And it's important to keep working toward solutions and to understand what the needs are out in the field,” Miriano “Max” Ravazzolo, C.E.O. of MB Crusher America Inc. said. MB products are used in airfield damage repairs, base construction, runway maintenance, concrete and asphalt recycling, on-site processing, demolition and excavation jobs, pipeline work, road work, quarries and mines, and environmental reclamation projects. For information, call 855/622-7874 or visit www.mbamerica.com. Federal customers can purchase MB's products through the GSA Advantage! catalog at http://bit.ly/mbgsagov or through its contract number, GS-30F-007DA.